I was a Cub Scout back in the early 70’s. At that time, Cub Scouts was a 3 year program. You started out as a Wolf in 3rd grade, became a Bear in 4th grade and a Webelo in 5th grade. So, I made three pinewood derby cars. 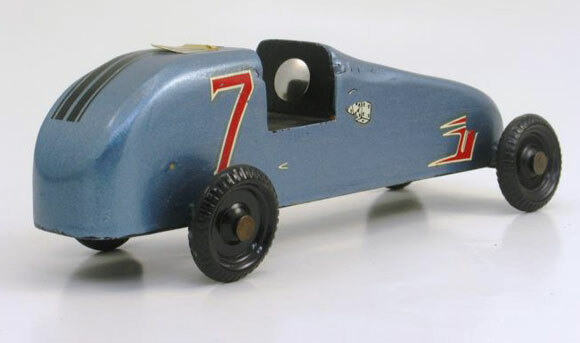 Ever since my son Noah received his first pinewood Derby car to build in December of 2005 I had been looking for my old pinewood derby cars to share with him. 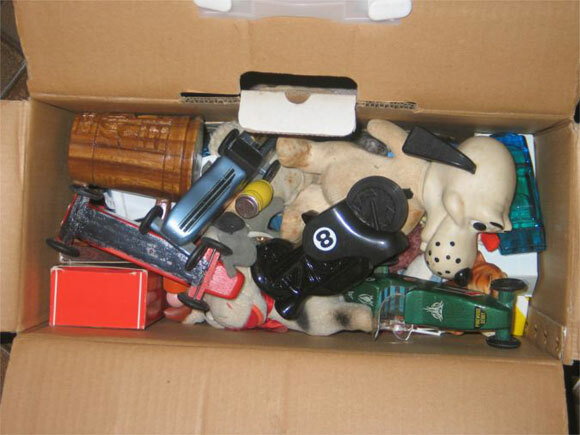 Sometime back in 1992 I had packed them away when we were moving to our new house, and they were never to be seen again. Every year I spent a couple of nights looking through some old boxes in the basement for the cars. Probably at that point, I had been through all of the boxes multiple times looking for the cars. So last week I was again looking through the same boxes (for the same cars), and I had an idea; maybe the cars were in the attic over the garage. When I finally got a chance to look up in the garage attic, I found an old printer box that seemed kind of out of place. I was thinking, “this might be the box,” but I had thought that before about some other boxes. But this time there was success. There they were, thrown in with some other junk. So I brought the box down and took some pictures of the cars. 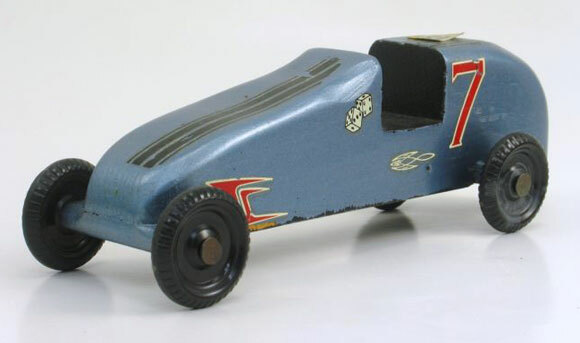 This was my first pinewood derby car. Apparently my dad and I didn’t worry about the 5 ounce weight limit as it only weighs 3.43 ounces. But of course the cars were measured on a spring type postal scale that wasn’t very accurate. The car looked as if it could have been sanded better before the paint was applied; and the rear body is not very symmetrical. 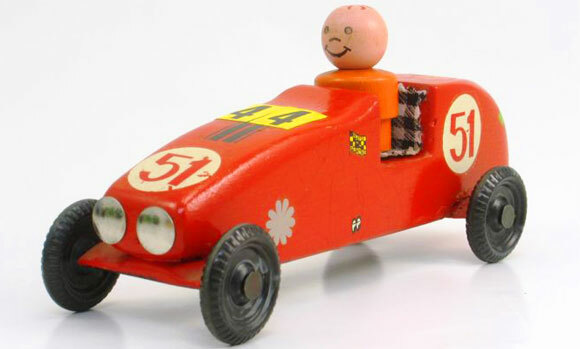 But it was my first pinewood car, and to me it is great! It was decorated with plastic model decals that my dad had and has a thumb tack as a steering wheel. The Bear car is finished better (could maybe have used some better detail sanding on the edges). 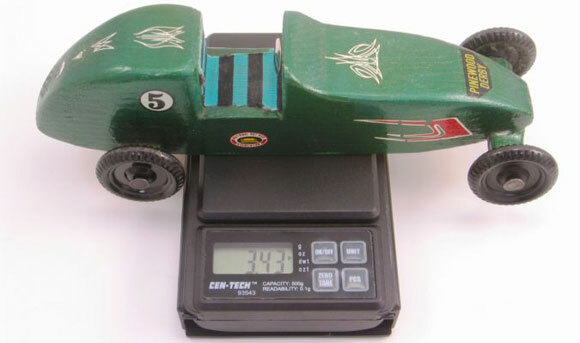 The Bear car has additional weights on the bottom of the car to bring up the weight (maybe a little too much – it weighs 5.35 ounces). This was the year when we moved into our new house and I moved to a new Cub Scout pack. 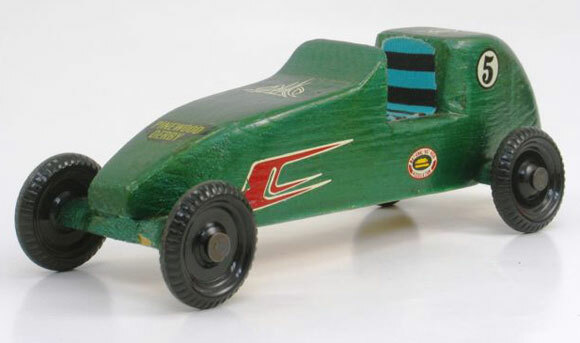 I remember we needed to paint the bottom of the car black so the finish line sensors would pick up the car crossing the finish line (the new pack had one of those “electronical” sensors to determine the winner). On the car, the thumb tack accessories continue. The Webelo car is a lot smoother. I think I remember painting this car in a cardboard box with model spray paint. 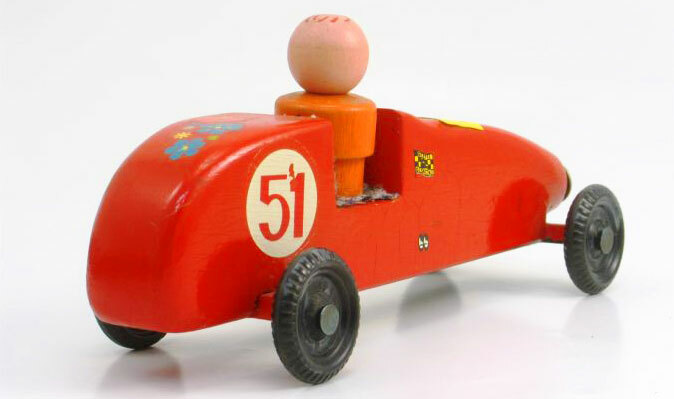 This car is way “advanced” as it actually has a wooden Fisher Price driver in it (back when they were made of wood). But it is also way underweight (3.63 ounces). And yes, the steering wheel cannot be seen so the thumb tack accessory is headlights. None of these cars ever had a chance at winning a trophy, but that is all right. Just looking at them today makes me very happy. 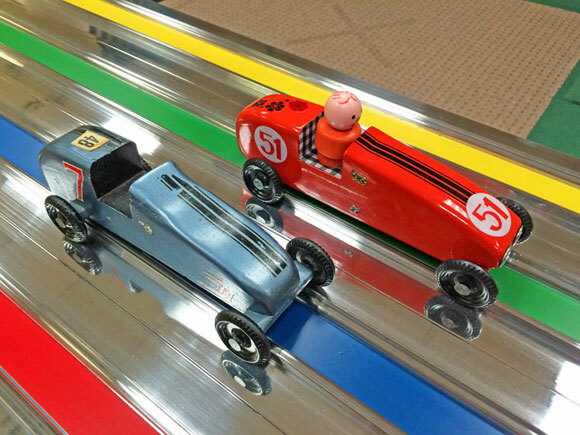 It is good to finally have my original pinewood derby cars back. Noah can’t wait to put them with all of the other family pinewood derby cars. I just want to thank my dad for helping me to build these cars (and all of the memories that go along with them). I guess that is indeed what this pinewood derby stuff is for. I guess winning is something, but it is definitely not everything. 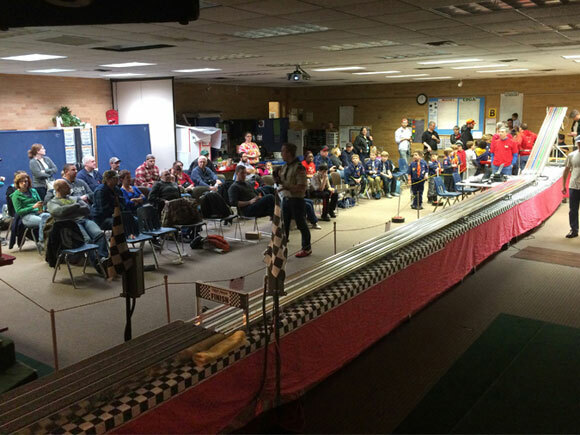 On March 15, 2014, I left early in the morning to help run the Pack 306 Pinewood Derby. This derby was for a new pack at a new location. We were at breakfast before the derby and I used my phone to see where the church was located. It was at this moment when I realized what this church was – back in 1972 it was an elementary school named Crystal Heights Elementary. At the time I was a fourth grade student at the school and a Bear in Cub Scouts. 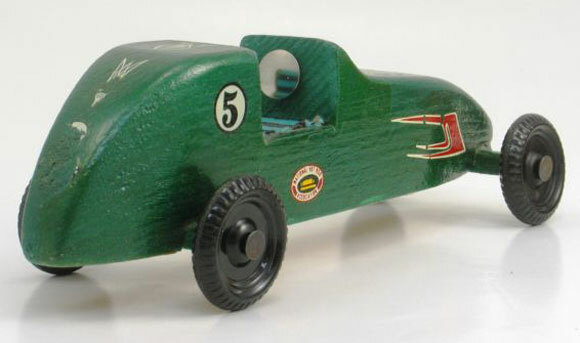 The Bear car and the Webelo car were both raced in the same building and in the same room as the pinewood derby that was held that day. Here is a picture of the track set up in the multi-purpose room; notice how the track fills the room. 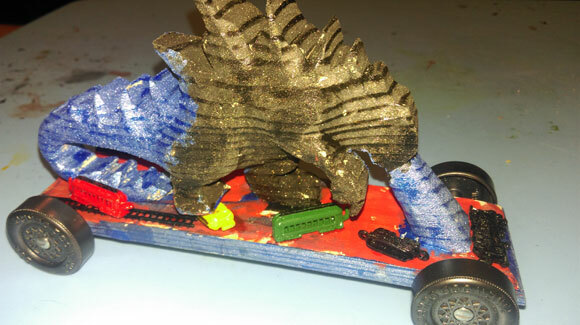 Here is a picture of my Bear and Webelos pinewood derby car on the track. It was great to be in the same building; I even stopped by my old fourth grade classroom. What a great day! A boy was having a lot of difficulty in French class. We built this car for my five year old to race in our “Me Too” class. It’s the new Godzilla and painted by my son. He wanted tiny army men, but we could not find any so we found a toy train from a doll house accessory kit. Godzilla did not place in the race. However he did get a lot of attention. My boys are more interested in making cool cars than winning trophies. They just want the car. My son found this design online and helped cut it out for the 2015 races. He never named this car so I call it Caleb’s Car. I think the design can be found online for free and is called Mad Max, however we made some upgrades. After drawing out the design on a typical pinewood block he drilled new extended axle holes 5/8 inch from each end of the car. Additionally, the right front axle was raised. He then drilled weight holes so that the center of gravity was exactly one inch in front of the rear axles. He used tungsten to reach 5 ounces. After hand sanding the car, a wood sealer was used multiple times and sanded in-between applications. I wish I had a photo to show you the car at this stage. The wood was transformed into a work of art. The car actually appeared and felt like a smooth wood toy from the 80’s. I was sorry to see it painted. He then put eight coats of Black Dupli-Color automotive paint, making sure to wet sand between application. Dry- transfer decals were used for the flames, then four coats of Dupli- Color Clear Coat were applied. Finally, Turtle Wax was applied and buffed to a shine. The car took first place in the Tiger Cub speed group, and fourth in the pack for speed. You have a large number of options. 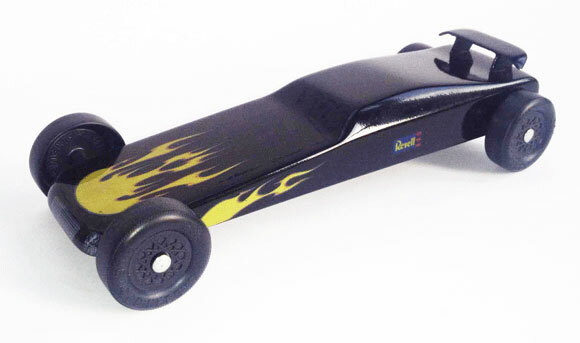 Can you recommend your fastest set of legal axles for a Cub Scout Pinewood derby? We want to win! If the pack rules are very picky, and you want to follow the letter of the law, then use part 4097. If the pack rules are not so picky, but you want the axles to look exactly like BSA nails, then use part 4094, 4056, or 4035 (same axles, just unpolished, polished, or polished and bent for rail-riding, respectively). If the pack rules are not so picky, you are not rail-riding, and you want grooved axles, then go with 4099 (same axle as 4094, just grooved). If the pack rules are loose, go with 4051 or 4052 (non-grooved and grooved, respectively). These are the best axles. The head looks like a BSA nail. I purchased the Max-V-Lube from you last year and the directions say not to add more graphite after I complete the first seven steps. Why? This doesn’t make sense to me as I watch all other pinewood racers dump graphite into the axles right before race time. I’m completing the car a week or so before we race and I want to add more graphite right before the race. Can you give me your opinion as my son and I are new to the pinewood racing event. Anytime you add graphite, you must work the graphite into the wheel/axle by spinning. This converts some of the loose graphite into a coating on the wheel bore, and sheds the excess graphite. If you add graphite and don’t spin it in thoroughly before racing, the first few runs are generally slower as the graphite is worked in and the excess is being shed. When there is too much graphite, the wheel cannot spin at top speed (basically clogged up). So best performance is achieved by thoroughly lubing the wheels and axles, and making sure the graphite has been spun in well before racing. I have a question I hope you can help me with. When we work on our car bodies, I’m never sure what to do with the area around the axle slots where the wheel hub can rub. It’s such a tiny area, but when that little wheel rides up against it the surface needs to be just right. What is the proper way to prepare this area? I have had good luck with lacquer paint, as it dries very hard and slick. Then with graphite on the hub, the friction is minimal. However, many people leave that area bare and rub graphite into the wood and into the hub. Either method works. But if you are using brush paints, or enamel paints, I would go with the bare wood method. With lacquer spray paint and clear coating, I would go with the paint method.